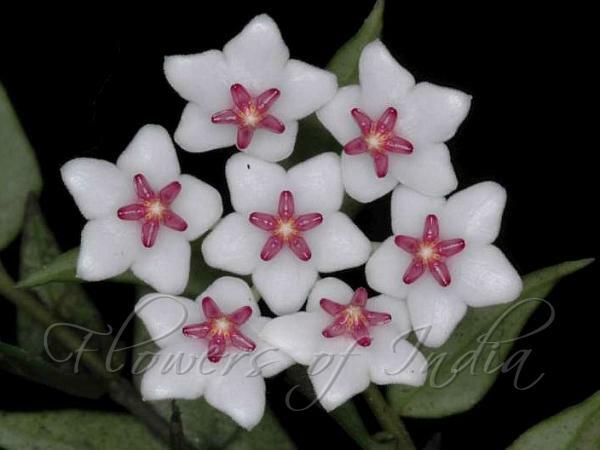 This hoya is native to India, Thailand and Burma and it was described in 1905. It's a hoya best suitable for growing hanging. The leaves are small, lanceolate shaped about 3 cm long and 1 cm wide with a lowered center vein. Clusters of waxy white, pink centered, fragrant flowers. Small pointed leaves closely set on semi-trailing stems. The flowers are white with a pink/purple corona and have a nice fresh sort of perfume like fragrance. They are about 1.5 cm and normally you will wind 7-9 flowers in each umbel. The flowers grow at the tips of the veins, have no nectar, last about 8 days and this hoya drops its peduncles after the flowers. 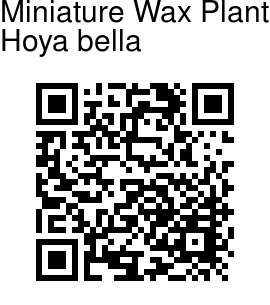 Hoya is a genus of 200-230 species of tropical climbing plants in the family Apocynaceae, native to southern Asia (India east to southern China and southward), Australia, and Polynesia. This genus was named by botanist Robert Brown, in honour of his friend, botanist Thomas Hoy.